The emotion of the crowd was the inspiration for the special exhibition that explores how sports and athletes helped console a grieving nation and provided a reason to cheer again following the 2001 attacks. C&G Partners was tasked with exhibit design, graphic design, and sound and media production for the exhibition. 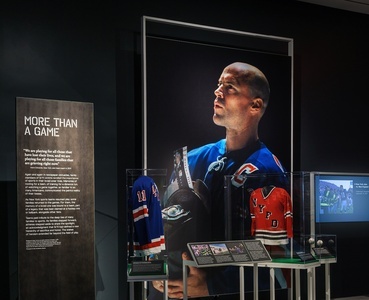 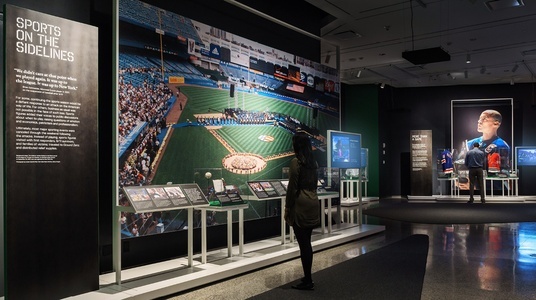 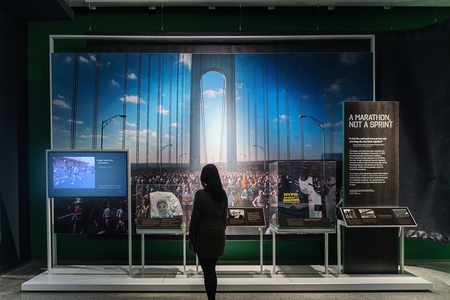 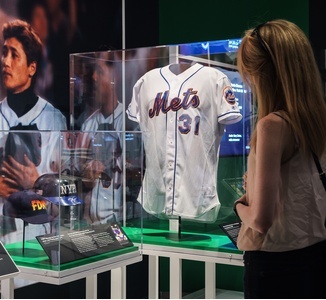 Designed as a chronological account, the exhibit begins in the moments after the 9/11 attacks when national sports were suspended and New York metro area stadiums were used to support relief efforts. The exhibition is divided into nine sections, each of which includes dramatically large images, custom short documentaries, objects from the museum’s collection or on loan for the exhibit, and poignant quotes. 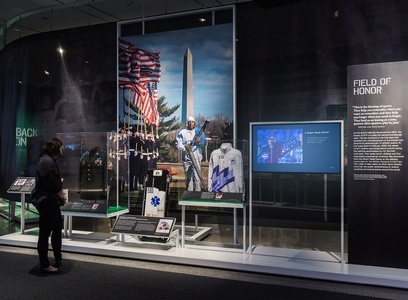 Careful consideration was given to the arrangement of visual, spatial, and material elements of the environment, creating a composition that visitors can easily navigate while maintaining the sequential exhibition flow. 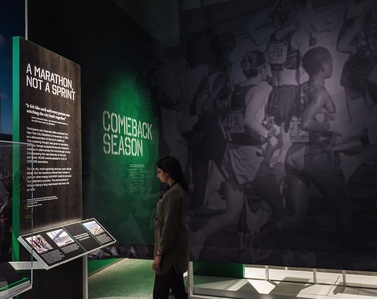 The gallery space is divided by a translucent scrim made of a material reminiscent of sports jersey fabric, while a varsity-inspired typeface and the use of astroturf green echo the exhibit themes. 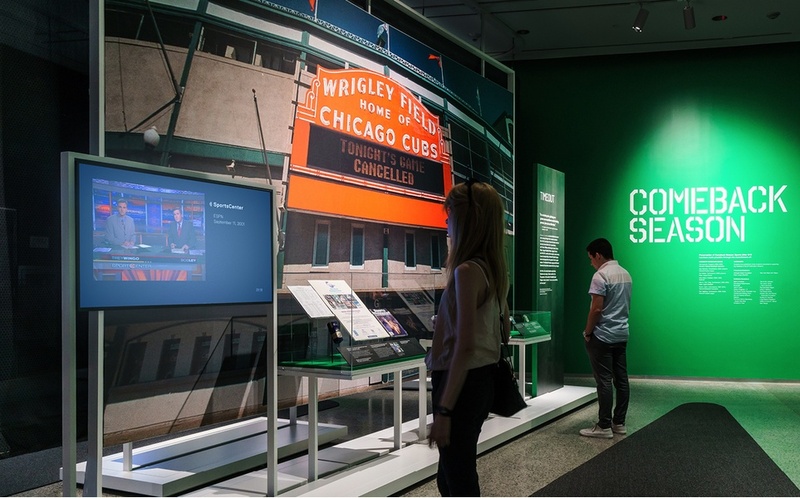 Media is a central exhibition element: custom-made short documentaries drawn from oral histories are combined with powerful excerpts from media of the time, and an emotive audio score provides context and enhances the narrative. Another key feature is the halftime digital installation. 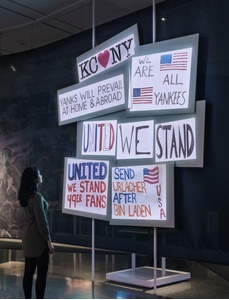 The large-scale projection map of fan-made ephemera shows the evolution of fan-sentiment in the days, weeks, and months that followed 9/11.